Environmental Policy | Company | Nitto Co., Ltd. Thorough environmental management system…..To protect the beautiful earth. Not only important towards improving specifications and quality of our products, but we also believe that all company activities including environmental and safety activities aimed toward a more harmonious coexistence with the Earth, are conducive to "quality". As part of this belief, we have reduced the use of organic solvents at the precision cleaning and drying process as much as possible. Instead of organic solvents, we have incorporated the system to use high-purified water and hot purified water so that it is possible to set protocols in each process line to help decrease environmental burdens. Disposed industrial wastes are recycled through the water purification system installed in the plant property and cleaned water containing no contamination and pollution is released back to the environment. 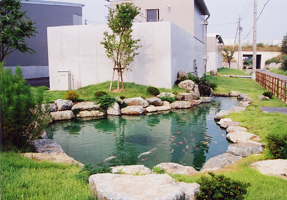 To further provide a cleanliness "barometer" of environmental preservation, we have an ornamental Japanese garden pond with carp using the cleaned plant wastewater, which was designed with the intention of bringing more awareness of environmental preservation among the employees. 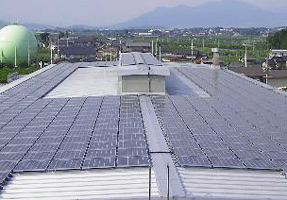 As stated in the business principle, our goal is "to interact and coexist with the local communities through business activities fostering coexistence and cooperation with the society and natural environment," and also "to contribute to the development of the local communities and environmental preservation, improvement, and maintenance". These are among our highest priorities and vital to our corporate business. Keeping this in mind, all Nitto employees work concertedly toward the preservation and improvement of the global environment across the entire fields of corporate business. We will establish, sustain, and continuously develop an environmental management structure from the perspective of environmental preservation and improvement of global earth. We will promote the efforts to reduce and recycle industrial excretion and waste, minimize the usage of chemical substances, and improve energy and resource savings in our entire business activities. We will always make the greatest effort to implement the most environmentally-friendly production and to minimize impact on the environment by setting environmental purposes and objectives. 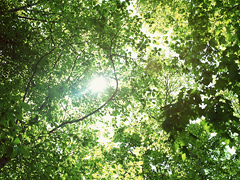 We abide by related regulations and other requirements that we agree and at the same time reinforce corporate environmental activities to reduce environmental pollutions and environmental preservation. We will contribute to society through efforts to promote cooperation and solidarity with the local communities and pass the beauty of nature and water of the adjacent Chikuma River on to the next generation. We will fulfill our responsibilities to promote "harmonized balance of corporate business and global environment" and "preservation of global environment" through the education of the entire employees and official campaigns for Nitto's environmental activities. 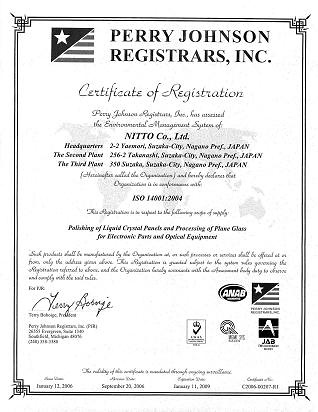 Determined to actively promote environmental preservation, Nitto acquired the compliance certification of ISO 14001:1996 in the environmental category in December, 2002 (upgraded to 2004 edition in 2005). Under the environmental management system highly controlled and ensured by the certified environment, we strive to integrate environmental conservation into all levels of our business activities, aiming to continuously contribute for the improvement and development of "healthy and robust communities". Copyright (c) NITTO, All Rights Reserved.